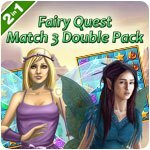 Fairy Quest Match 3 Double Pack Game - Download and Play Free Version! Calamity has struck a peaceful fairy kingdom and it's up to you to set things right in this enchanting match-3 fantasy adventure. An evil sorcerer sucked all the magic out of Fantasyland, leaving it polluted and the magical inhabitants trapped. If you can't clean up the landscape and bring back the magic, this could be the end for our fairy friends! Are you ready? But you don't have to do it alone! Four magic friends are here to help: the Wind Fairy, Fire Fairy, Lightning Fairy and Clover Fairy. With your puzzle-solving skills and their fantastic powers, there's no obstacle you can't overcome. Help them clean the air and save the fairies. 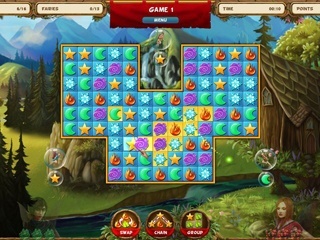 Enjoy 120 levels of fantasy-inspired match-3 fun. Switch between three different match-3 game modes while you play! Explore twelve different enchanting locations. Collect fanciful power-ups extras and use them wisely. And the fun doesn't stop there: head-scratching bonus puzzle games will keep you immersed in this otherworldly realm. King Feodor needs your help! A dark shadow has been cast over the fairy kingdom, and now it's up to you to save the realm and its people. The Holy River is polluted and all animals and fairies who drink from its waters become severely ill. If you don't manage to cleanse nature, it could mean the end of your fairy friends! Are you ready to face this challenge? Luckily, you're not on your own in this. 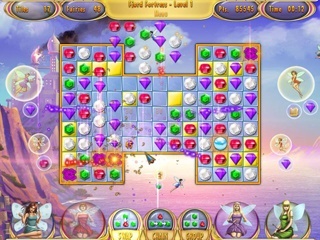 Four magical fairies will help you in this Match-3 adventure. Enjoy close to 100 enchanting levels that will put your wits to the test! Discover accursed locations, collect useful power-ups and switch between 3 game modes. As you ponder over intriguing puzzles, you immerse yourself in a fantastic realm full of magic.